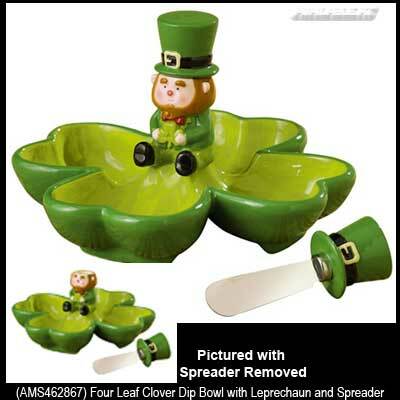 This piece of dinnerware is a clover shaped Irish dip bowl that is enhanced with a leprechaun spreader. Sorry, this Irish condiment dish is now sold out. This Irish dip bowl features a four leaf clover with four sections along with a leprechaun spreader that pulls out of the center. The clover dip bowl is ceramic and measures 7" wide x 4 1/2" tall. The leprechaun spreader is 5" long and has a stainless steel blade; both are dishwasher safe. This Irish dinnerware is gift boxed, complements of The Irish Gift House.